In new research from the journal PNAS published today (“Biparental Inheritance of Mitochondrial DNA in Humans“), which is unfortunately behind a paywall, researchers identified paternally-inherited mitochondrial DNA in 17 individuals spanning three unrelated families. 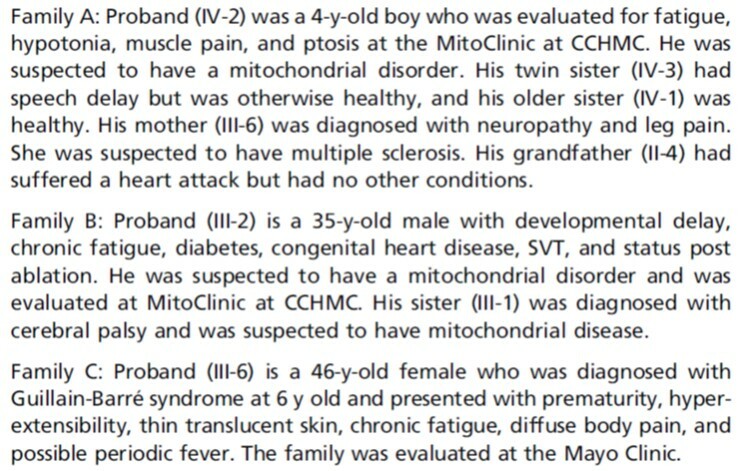 What is missed from the media coverage, however, is that these families were identified because member(s) were presenting with conditions that made the researchers suspect a mitochondrial disorder. Additionally, it is important to note that this is not a novel discovery, rather a more comprehensive analysis of, and long-sought confirmation of, paternal transmission. Paternal transmission of mtDNA was first identified in 2002 in an article that was aptly named “Paternal Inheritance of Mitochondrial DNA.” In this case as well, the individual was experiencing mitochondrial disease (in his case, it was very severe). This remained one of the only, if not the only, verified case of paternally-inherited mitochondrial DNA until the most recent study (see “Paternal mtDNA transmission” at Wikipedia for more links and information). This is a good sign, namely that these instances of biparental mtDNA inheritance are going to be exceedingly rare and may be limited to cases of mitochondrial disease (whether the disease causes the biparental inheritance, or vice versa, is unclear). The supplemental information for this paper is free, and is HERE. This research strongly suggests that while paternal inheritance of mtDNA can occur, it is extremely rare and likely co-presents with mitochondrial disease. Thus, all mtDNA research to date suggests that paternal inheritance of mtDNA will not affect genealogical research. just curious what the family tree looks like on these subjects? Any cousin to cousin or brother/sister marriages that may have contributed to this situation presenting itself? Or other paternal or maternal cross marriages. thus consolidating certain disease in the subsequent generations. Birth defects I think it is called? In my case my dad’s MtDNA and my mother’s MtDNA happen to be the same. They are not related thru their mother’s in recent history or records. So many , many years back both of my grandmother’s MtDNA came from the same woman. ( K1a4a1a-T195c! ) Both myself and my son show up on my dad’s MtDNA matches as a 3 Genetic distance. So what does this mean? Since all three of us have the exact same MtDNA Haplogroup. There would be some “extra” mutations (ones not used to define a haplogroup). Assuming you tested at FTDNA, you can see the list of extras on the RSRS tab. The list will be different for you and your father. What about the pregnant woman who was going to be charged with fraud when trying to get social services for herself and her children. Because the children did not share her mtDNA. When she gave birth to the child she was carrying, they were there. The baby did not share her mtDNA. Upon further testing, it showed that the mother carried two distinct mtDNAs. 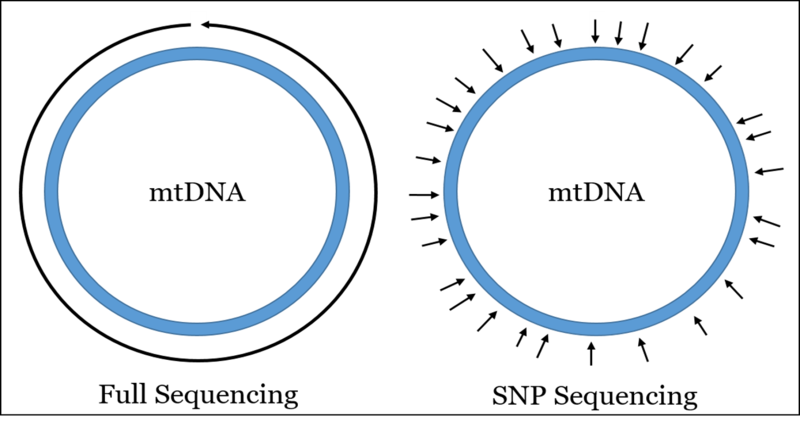 Actually, the mtDNA was the same. It was the autosomal DNA from the “vanishing twin” that made the children look like the mother’s nieces/nephews. Liked and shared. Thank you. I can tell you this much, I had a mtDNA test done (through FTDNA) and it showed matches to Sweden which I could have only acquired from my Mother’s father. I was expecting to find traces from the UK, because I have traced the Matriarchal line back to the 18th century. The results even showed matches to individuals from the exact town and area in Sweden from which my mother’s paternal grandmother came from. So, while as a general rule, mitochondrial DNA may be passed from your mother, I’m not willing to just abide by what has been stated as fact, simply because ‘that is what research has shown in the past.’ At the very least, I do not have a vested interest in maintaining the belief that it is purely maternal.